As Paris is only two weeks away, I thought it was an opportune time to write about the amazing confluence of events that led to this post. Last summer when I escorted my daughters on their first trip to Paris, we made the pilgrimage to Versailles, including a visit to the Cour des Senteurs, thanks to my good friends at The Buzz. 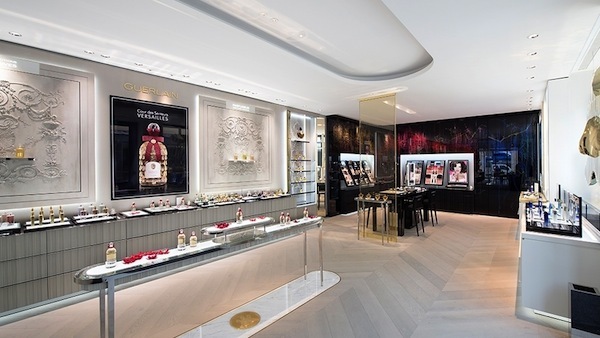 Opened last April to coincide with the city’s grand celebration of the 400th anniversary of the birth of Le Notre (designer of Louis XIV’s gardens), it is a complex dedicated to the tradition of fragrance. 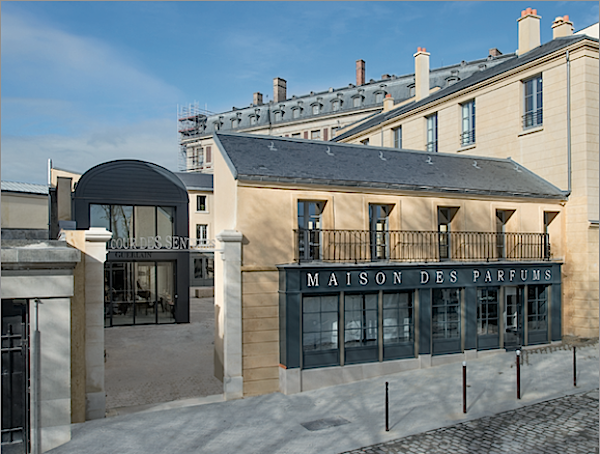 The birthplace, in the 17th century, of perfumer as a profession, Versailles is also home to the Institut Supérieur International du Parfum, the only international diploma training for those in the perfume industry. Anchoring the square of the Cour des Senteurs is the Maison des Parfums, a fun sensory mini learning center about the history of perfume, conceived of by historian, professor and perfume expert Elisabeth De Feydeau, author of A Scented Palace and more recently, From Marie Antoinette’s Garden: An Eighteenth-Century Horticultural Album, which Courtney at Style Court explored here. 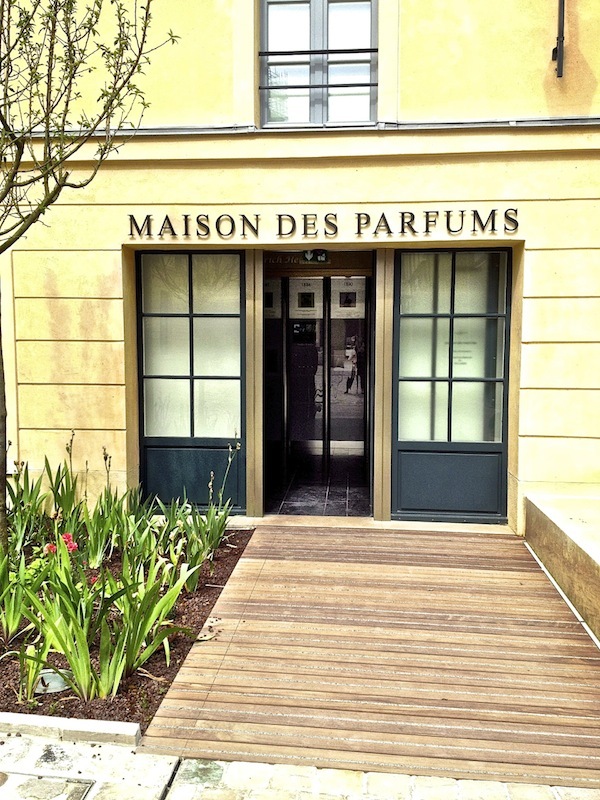 This opens onto the Place des Senteurs, a courtyard featuring a small garden of varied fragrances, anchored by four great names in French luxury, all connected to the world of scent. A Diptyque boutique carries its unique home fragrances including an exclusive presentation box of three mini-candles echoing the Garden of Fragrances. Fourth generation glove maker Maison Fabre, above, features its collection of exquisite handware including the revival of scented gloves, a fashion trend during Louis XVI’s reign. Lenôtre offers sweet and savory creations including a special glitter-sprinkled macaron pailleté filled with jasmine flower preserve in honor of Marie-Antoinette’s favorite flower. and a large stone wall sculpture of the Guerlain symbol, the star of the Sun King, by Pierre-Louis Dietschy, below. 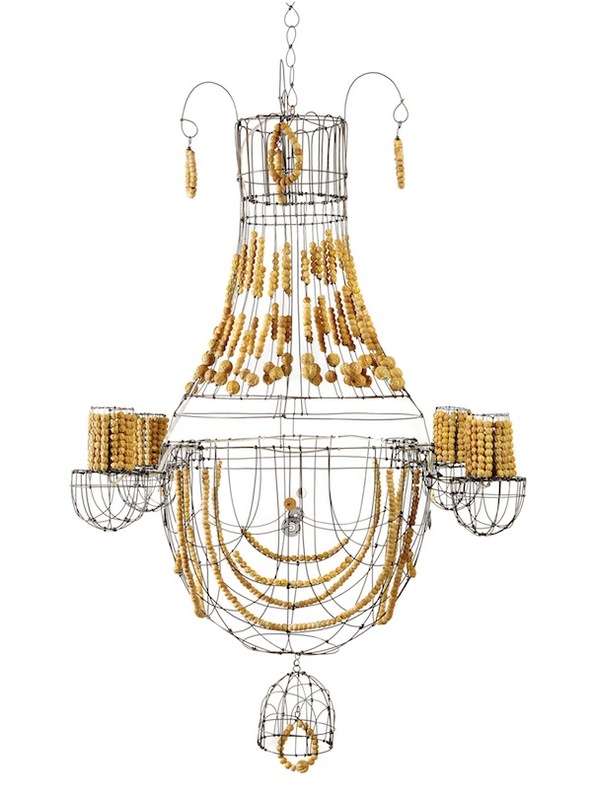 In front of the symbol, in the double story space, hangs a stunning chandelier, which I inquired about to no avail. 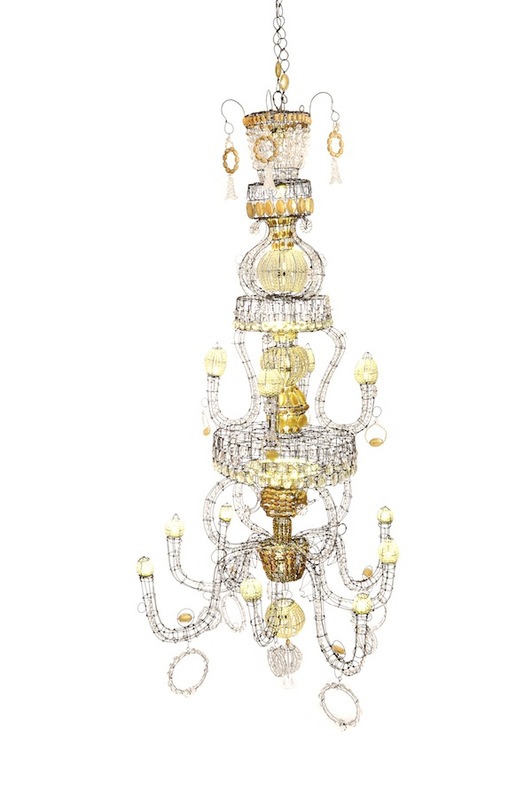 A seemingly modern version of a chandelier in the palace, it echoes the yellow of the sun king and the color of Marie Antoinette’s favorite jasmine, adding a glittering radiance that is both elegant and whimsical. 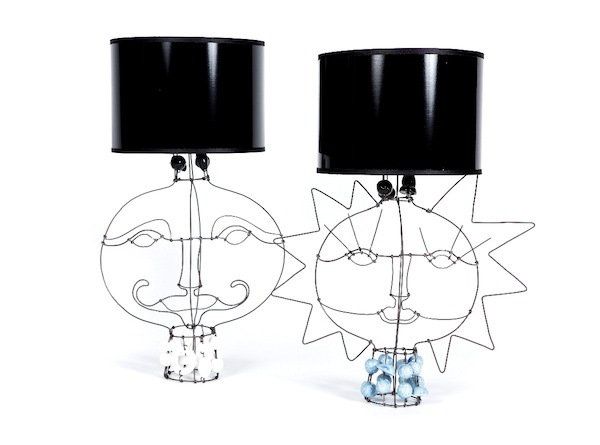 Later in the summer, I serendipitously received an email from and began a correspondence with Lisa Fontanarosa, a curator of sorts, representing an unusual collection of artists around the world who create sculpture and decorative art for the home. I immediately recognized the whimsical and witty works of Marie Christophe, who, as I’m sure you’ve surmised, was commissioned by Guerlain to create the work above. 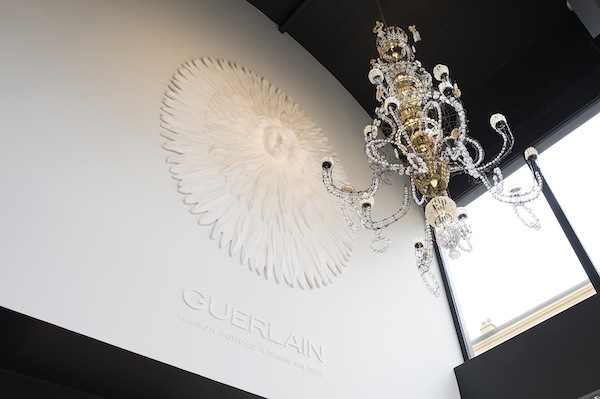 A sculptor living in Toulouse, she was indeed inspired by the crystal originals in the palace as well as the gilded bees on vintage Guerlain bottles. 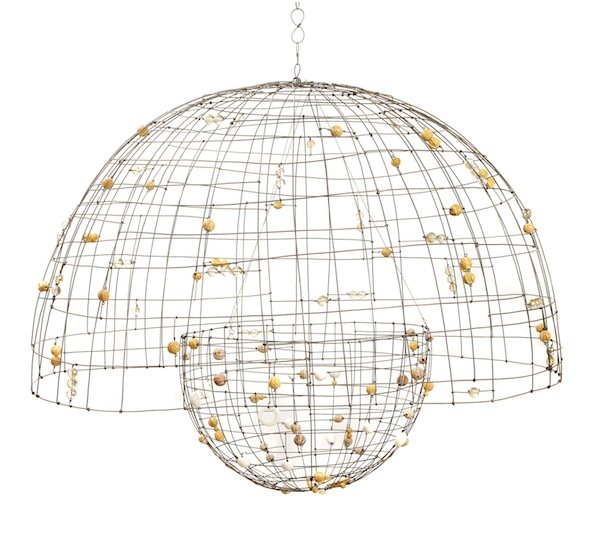 Her LED chandelier is 7 feet high and includes flea market crystals as well as some crafted by contemporary artisans. As it turns out, she has collaborated with many other distinguished brands as well. 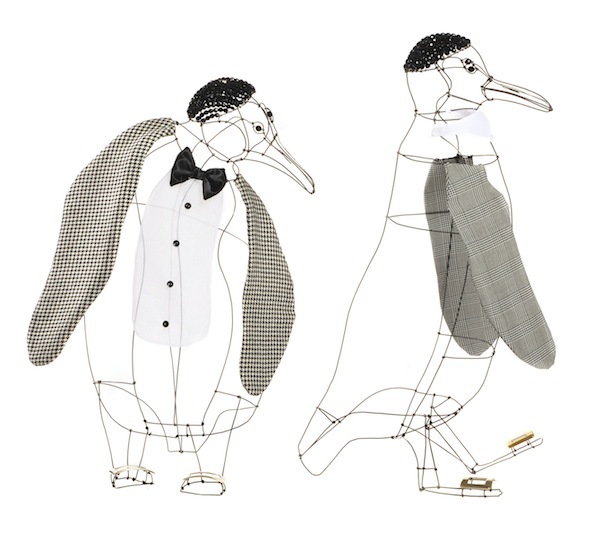 How charming are these penguins she created for Roger Vivier? 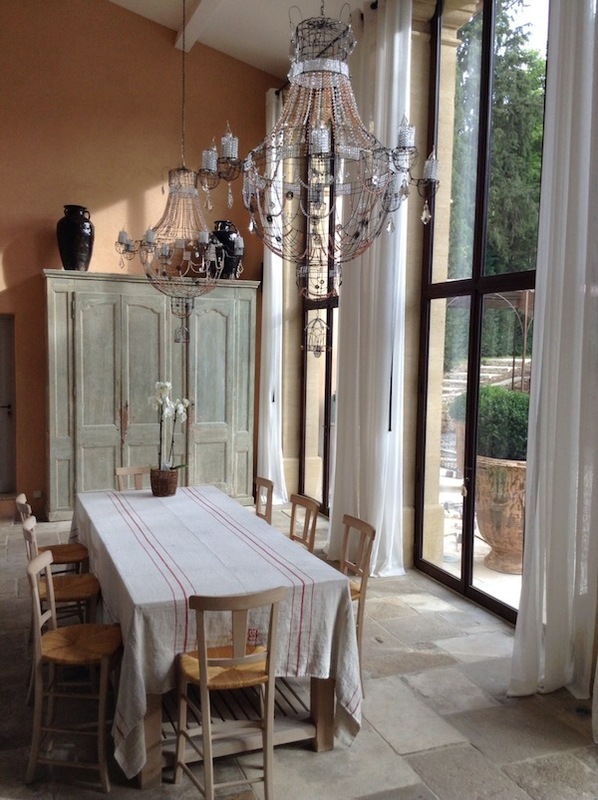 as to a modern dining room in Barcelona. 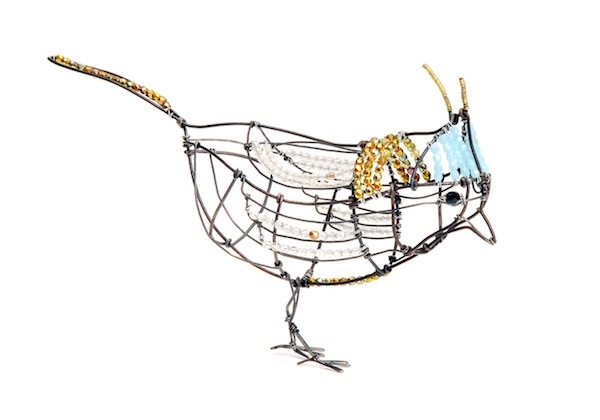 and she does custom work in case you didn’t see the perfect piece for your home. Any inquiries about Marie Christophe are fielded through architects or designers to Lisa’s office. And next time you are making the trek to Versailles, be sure to stop by the Cour des Senteurs, where you can learn, shop, have a snack and even take a perfume class at Guerlain. It’s a busy day in the city of scent. This entry posted in art, beauty, gifts, interior design, learning, travel. 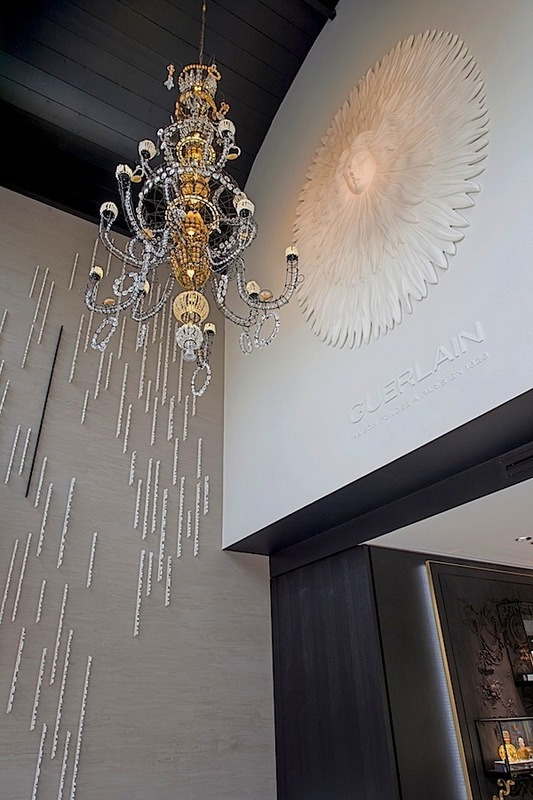 Entry Tags: Cour des Senteurs, Guerlain, Lighting, Marie Christophe, perfume, Sculpture, Versailles Bookmark the permalink. Stacey, Are you heading to Paris in two weeks? So am I – two weeks from today I’ll be hopping a flight. Perhaps we can meet up if schedules permit? I’ll email you. If I make it to Versailles I will most definitely stop by the Cour des Senteurs! I’m enchanted by the creations of Marie Christophe. Those penguins are a delight. Love her whimsical yet beautiful style. Fabulous! Sent you an email Jeanne! These are so charming! Wonderful post. Have a fabulous time in Paris! Serendipity and 6 degrees of separation make for fun blog posts! So much to learn from this post! Love it. What a wonderful find, Stacey!! I am a bit of Diptyque fanatic. I always come back to their wonderful candles and their satin oil is my all time favorite for spritzing on post-shower. 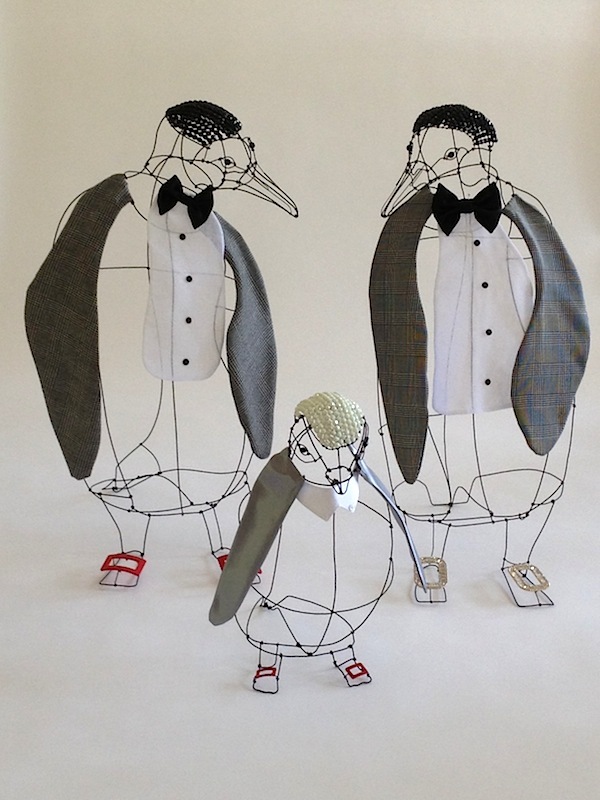 Marie’s works are whimsical and theatrical! I hope you and Jeanne are able to meet up. Wish I could be there!! yeah, so nice blog about Marie Christophe, Guerlain and Cour des Senteurs, thank you so much for sharing such a brilliant stuff. Really Loved It. Thank You for so nice stuff. Beautiful home and interior decoration. really love it. 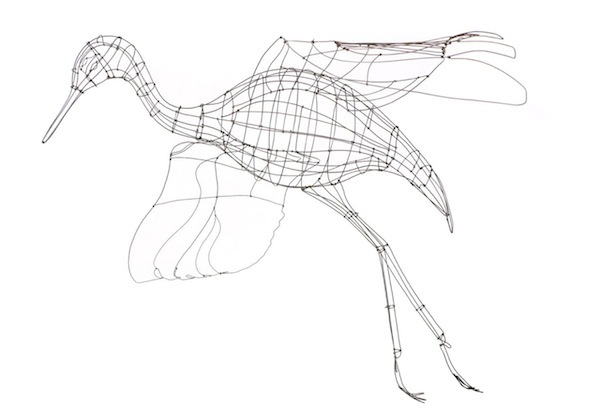 Thank you Stacey…wow can’t wait to be back in Versailles and visit ” la cour des senteurs” ! That was a wonderful read today. thank you. I adore Versailles and recently found out why via my ancestry, life is interesting.